Rush Fitness Water and Mizuno teamed up for a morning of pavement-pounding competition at the 2008 Mizuno Rush to Infinity. 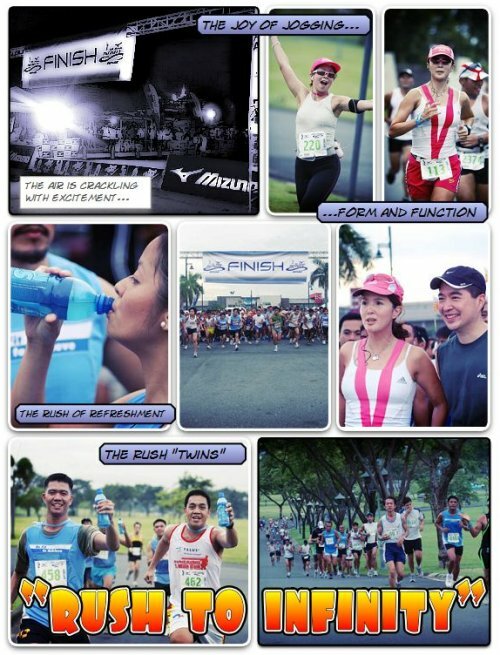 A fun run that featured 15k, 10k and 5k divisions, the Rush to Infinity drew over 2000 participants, from seasoned endurance runners to first time competitors. The race began near the NBC Tent at the Fort, with competitors of the 15k division first seeing action, followed by the 10k and 5k runners. Preliminary warm-up exercises were led by trainers from Fitness First. Personalities including Tessa-Prieto Valdez, Lance Gokongwei and Senator Pia Cayetano graced the event and ran in their respective divisions. Real fathers back their words up with action, and thereby set the example for their families to follow. The truth of this comes out in the life and work of Mark Ellis, as a look at his life will show. 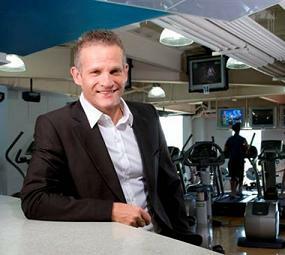 Mark Ellis is no less than the Country Manager of Fitness First, a chain of upscale fitness centers in Metro Manila. And as befits a leader of an organization such as his, Mark is also a triathlete — a serious competitor in the age-group divisions of his chosen sport. Mark is also a family man; husband to his wife Doray, also a triathlete, and a committed father to two lovely daughters, in whom he works to inculcate the values of the active life and the love for family. But of course, triathlon isn’t all about intense competition. “I wouldn’t do it if I didn’t have fun,” Mark says. “We have fun, we meet some great people; triathlon has been great for me, with my wife because it’s something we do together. And I can talk about spending time with my family; we train together, so that’s quality time for us.” And, sharing a story about the time he and his whole family joined a charity event, Mark says, “We got the little girl in the stroller,” he says, “we brought the dog along as well, and so the whole family was out doing a 5k run.” Fatherhood, then, is close to the heart of what Mark holds dear, as seen by how he cherishes time with his children. “I want to be part of their lives. I want to be hands-on, I want to watch them grow up. I really want to encourage that time we spend together. There’s not always enough time to spend together during the week because I’m working, so weekends for me is really a sacred time.” A sacred time for the rush of fatherhood. 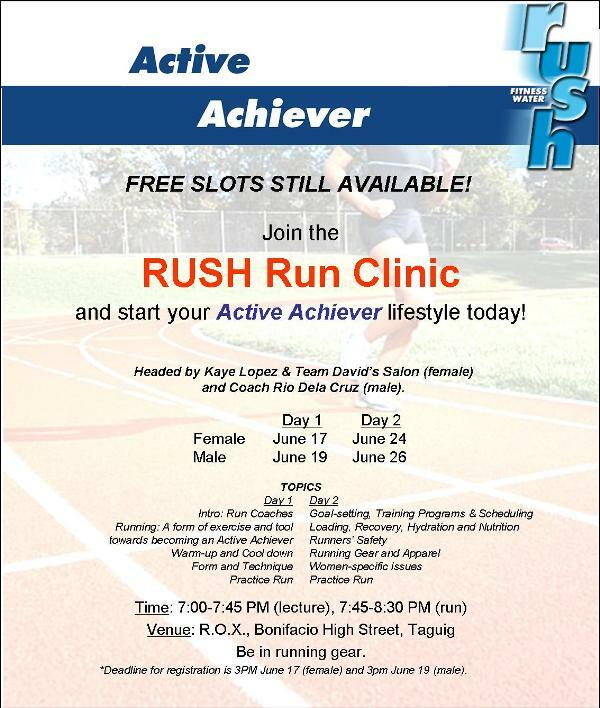 Learn the basics of running from the experts by joining the Rush Run Clinics. 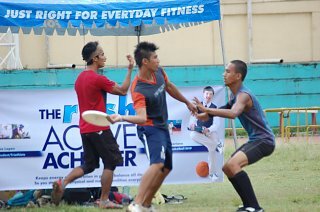 Rush Fitness Water recently gave its all-out support to the 1st Cebu National Ultimate Frisbee Tournament dubbed “Ultimo Abril 2008” at the Abellana Sports Complex.